The Revolutionary War has its own national holiday. World War II has spawned countless books and movies. The Civil War boasts costumed re-enactors and a signature chess set. And the War of 1812? It has re-enactors, too. The country can’t get enough of them. The country of Canada, that is. “The demand for them right now is so great that it’s actually driving up the price,” said John Stagg, a University of Virginia history professor and author of “The War of 1812: Conflict for a Continent.” “They may even have to resort to the desperate tactic of importing a few from the United States. Currently enjoying its bicentennial — What, you haven’t pre-ordered the Postal Service’s forthcoming commemorative stamp? — the War of 1812 occupies a musty, forgotten junk drawer in America’s collective cultural consciousness, stuffed somewhere between the liberation of Grenada and the time Will Smith punched that extraterrestrial fighter pilot in the face. No memorial on the Mall. No memorial, buy-one, get-one-free mattress sales. The only war in the history of the United States referred to by its year. The only war in the history of the United States in which — yes, really — Canada won. A three-year, continent-spanning conflict against the British Empire that gave us Dolley Madison (the heroic first lady, not the snack cakes), the Capitol rotunda (built after a humiliating defeat, but still), the Kentucky Rifle (overrated, according to historians), the 1959 song “The Battle of New Orleans” (less accurate than a Kentucky Rifle, according to historians) and the “Star-Spangled Banner” (ironically sung to the tune of an old English drinking song — whatever), and yet is lucky to receive more than a few throwaway paragraphs in the average American history textbook. Don Hickey concurs. The nation’s pre-eminent War of 1812 historian, he began a lifelong love affair with the topic as a University of Illinois student in the late 1960s, writing his senior honors thesis on New England’s opposition to the conflict. Most schools at the time, Mr. Hickey said, carried Revolutionary War and Civil War experts on staff, and perhaps an Andrew Jackson scholar as well. For nearly a decade, Congress has entertained the notion of creating an official War of 1812 bicentennial commission; time and again, the same body of lawmakers that regularly honors things like craft beer and the University of Texas swimming and diving team has said thanks, but no thanks. Don’t imagine their constituents care: A recent poll by a Canadian research firm found that 36 percent of Americans could not name a significant outcome to the war. What about the District’s memorial to James Madison, president and commander in chief during the war? Why the antipathy? Start with the nature of the conflict. Fed up with British bullying and conscripting of American sailors and a Royal Navy-imposed embargo of trade with France — an offshoot of Europe’s Napoleonic Wars — Congress voted to declare war on Britain in June of 1812. The vote itself was bitterly divided, and came a few days after the British had decided to lift their embargo, the whole reason for the war in the first place. Case in point: In the Battle of Detroit, General William Hull was tricked into surrendering his 2,000-militiamen force to a smaller group of British Canadians and Native Americans without firing a single shot, thereby losing the entire Michigan territory. Perhaps America’s most memorable defeat came in August of 1814, when a force of about 4,000 British troops marched into Washington and set the nation’s capital ablaze, famously forcing Dolley Madison to save George Washington’s portrait from a soon-to-be-torched White House. Perfect pyrotechnic fodder for a Michael Bay movie, right? “Actually, the Navy Yard was set on fire by evacuating Americans to keep supplies and almost-completed warships from falling into British hands,” Mr. Budiansky said. Ineffective on land, America’s military proved surprisingly adept at sea, frustrating and humiliating the much larger Royal Navy. Ultimately, the two sides reached a peace accord in which neither nation made concessions and territorial boundaries returned to their pre-war state. Though the accord was signed Christmas Eve of 1814, word of the peace treaty didn’t reach the United States until after the Battle of New Orleans in early 1815 — an Andrew Jackson-led rout of the British that stands as America’s greatest victory in the war. “The conventional wisdom is that the war ended in a draw, because it was a draw on the battlefield,” Mr. Hickey said. “But if you look at policy objectives, the United States didn’t force the British to make maritime concessions, while the British achieved their objective of keeping Canada. No matter. Over time, Mr. Hickey says, Americans became happy with the War of 1812 because they thought they won. Canadians were happier because they knew they won. And the British? Happiest of all — because they forgot the whole thing. Not always. In the years following the war, books, plays and paintings celebrated the conflict, seen by Americans as both an honorable stand against British harassment and a consolidation of the Revolutionary War’s gains. American naval captains — the successful ones, anyway — even became household names. Battlefield glories — real and imagined — also influenced politics. 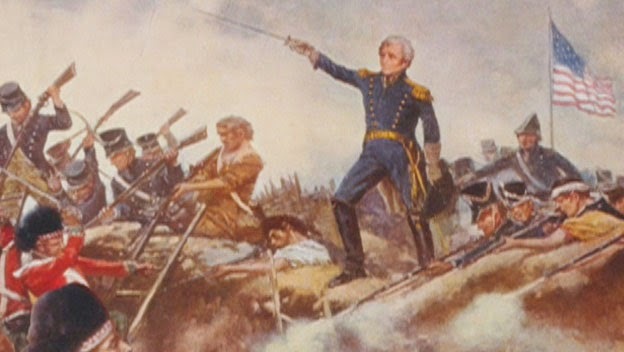 According to Mr. Stagg, the war helped propel both Mr. Jackson and William Henry Harrison to the presidency, the latter man running on a slogan, “Tippecanoe and Tyler too,” that referred to an 1811 battle in the Indiana territory that presaged the War of 1812. In Kentucky alone, Mr. Stagg said, the war produced three governors, three lieutenant governors and four United States senators — not to mention future Vice President Richard Johnson. The trauma and scale of the subsequent Civil War changed attitudes, transforming the War of 1812 into a historical afterthought. However, an ongoing bicentennial has dragged the conflict at least partially back into public consciousness. New York lawmakers have appropriated money for commemorative events. The Canadian government is spending an estimated $30 million on the same. As part of a larger, $12 million-plus public relations push, the U.S. Navy is parading the USS Constitution and other ships through Boston, New York, Baltimore, New Orleans and Norfolk. In Maryland — where cars have War of 1812 license plates and Gov. Martin O’Malley has participated in re-enactments — the state is holding a three-year celebration, which kicked off with a June ceremony at Baltimore’s Fort McHenry that featured recorded messages from President Obama, Canadian Prime Minister Stephen Harper and British Prime Minister David Cameron. “I must admit, when I visited the White House earlier this year, I was a bit embarrassed that my ancestors had managed to burn the place down 200 years ago,” Mr. Cameron joked during his message. Beyond “The Star-Spangled Banner” — composed by Francis Scott Key during the Battle of Baltimore — the War of 1812 ultimately resulted in Jacksonian democracy, a long-term Anglo-American peace, the birth of Canadian national identity, America’s eventual emergence as a naval power and a crushing defeat of Native Americans that paved the way for Manifest Destiny. It’s time, Mr. Stagg believes, the much-maligned conflict got a little more respect.